Acquired: Selected in the second round (10th overall) of the 2018 CFL Draft. Signed on May 16, 2018. 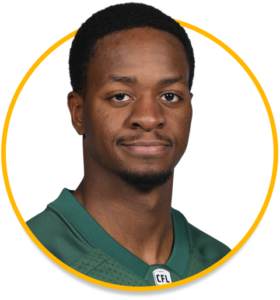 2018: The Eskimos second-round pick appeared in nine games this season and has two defensive tackles. College: Onyeka attended Wilfrid Laurier from 2014 to 2017. He appeared in 32 games and recorded 125 total tackles, two quarterback sacks, seven interceptions, six pass knockdowns, three forced fumbles and three fumble recoveries. Onyeka was named to the OUA Men’s All-Rookie team, and earned 2015-17 OUA and CIS Men’s First Team All-Star and All-Canadian honours.